One of the ways that you can make extra money on the side – or even make a good living – is to offer your services as a freelancer. I’ve been freelancing for several years now, and it is my family’s primary source of income. As a freelance writer, I know the value of writing as a career. 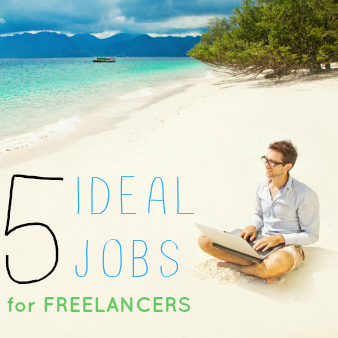 This is one of the easiest freelance careers to manage. You can usually do your writing on your own schedule, no matter how odd your hours are. From providing web content, to ghostwriting books for others, to creating press releases and ad copy, it’s possible to make money as a freelance writer. Since so much of life these days relies on the written word, someone with a little skill in that area can go far as a freelancer. Are you a whiz at InDesign or PhotoShop? If so, you might be able to offer your skills as a freelance graphic designer. From providing designs and images for web sites, to creating advertisements, there is little need for graphic designers to be in the office all the time. In my earlier life as a freelancer, I even did a little logo design and website button design. Visuals are a big part of what we see today, whether it’s an ad in the newspaper, a flyer at the local library, or a website, the skills of a graphic designer are often in high demand. I have a friend who works as a freelance software developer. He creates custom apps for companies. If you know how to code, there is no reason to sell yourself short for a salary at one company. The same is true if you understand web development. Learn programming languages (or put the languages you already know to good use) and offer your services as a freelance developer. It’s possible to earn top rates if you are good at what you do. As someone who works in the online space, I know a lot of people who provide freelance marketing services geared toward social media. Many of these freelancers refer to themselves as consultants, but it basically amounts to the same thing. If you know how to use social media to drive traffic to websites, and to convert social media into sales, you can offer your services on a freelance or consultant basis. With the tools out there for social media, this is a freelance job you can do on your own terms in many cases as well. It’s also possible for you to offer your freelance services as an administrative assistant. Many of the assistant jobs, from answering emails to scheduling phone interviews, can be done on a freelance basis. Keyword searches and research can also be done remotely by virtual assistants. If you are organized and can provide a number of these services for busy business owners and entrepreneurs, there is a good chance that you could make money as a virtual assistant. Freelancing this way does have a drawback that the other jobs don’t have: You might end up having to work certain hours in order to be available during the business day. What other jobs do you think are ideal for freelancing? Leave a comment! I have done a few writing jobs on freelancer.com. It is difficult because the people you are competing with will work for very low rates. I have been told that there is another site called peopleperhour that seems to have higher rates for this type of work.